This is so adorable for my granddaughter! She loves being a big girl!! 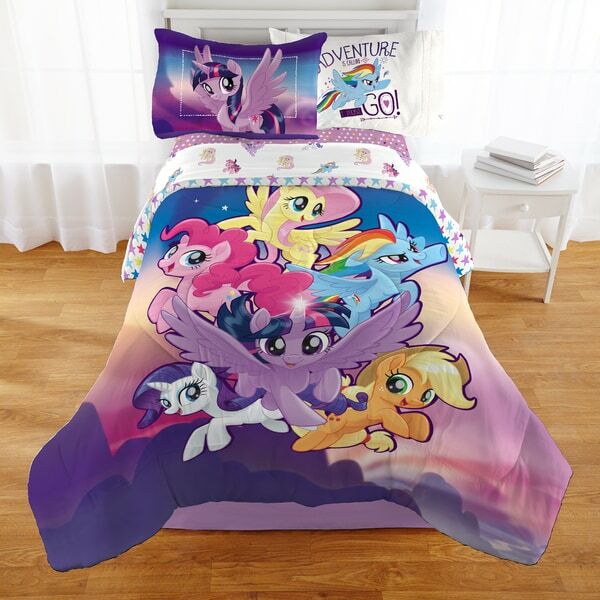 Little girls will love this adorable My Little Pony 'Twinkle Adventure' Bedding Ensemble. The set includes a reversible Twin/Full Comforter and sheet set. The comforter features characters from the popular show, Twilight Sparkle, Rainbow Dash, Pinkie Pie and their friends in a brightly colored retro ensemble and is reversible to let your child change the look of their bed by simply flipping the comforter over. Comforter is conveniently made to fit both twin and full size beds. Both comforter and sheets are made from soft polyester and are machine washable for easy care. The My Little Pony Twin size bed in a bag contains a Twin size sheet set and Twin/Full comforter. The My Little Pony Full size bed in a bag contains a Full size sheet set and Twin/Full comforter. My daughter loves this. I got the full size one so when it comes time to move her to an full size bed from her twin bed. She is already ready for it. It is big for a twin size, but nice. It is soft and comfortable. She loves the pillow cases as she loves Rainbow Dash better than Twilight Sparkle. As described - colors are bright, and out five year old was very happy with this birthday gift. My only issue is the same problem that others addressed - it says twin/full. The sheets fit fine. However, the comforter does seem a bit small. It fits the bed, but does not hang over the sides. As it’s for a child, I’m not too concerned. Gave it to my daughter for her birthday. Washed up well. Wish the sheets could be cotton but the polyester is soft. Nice bright colors that add a nice touch to her bedroom. Certainly big enough for a twin. Comforter might be a little small for a full. Looks just like the picture, and is bright and cheery-the perfect bedding set for any child who loves My Little Pony. Happy that it came with matching sheets as well, as sometimes it is a pain to buy them separately. Very cute bedding set! I purchased this as a birthday gift for my niece, she is transitioning from a crib to a big girl bed and my little pony characters are some of her favorite. she was so happy to get this bed in a bag set. My daughter loves this bed in a bag set. The colors are vibrant and colorful. The image is printed clearly and the quality is that of what I expected. The colors are very bright and pretty. Packaged fantastic with comforter and sheet set. Will make a perfect gift for Christmas. Very excited about it. Our youngest daughter got these sheets for her new trundle bed we also ordered from here. She loves My Little Pony and was excited she was able to get this set. My granddaughter just loved this set! Thanks Overstock! my 7 yr old loved this for her Christmas present. i also liked it because its very warm and its double sided. the comforter is also machine washable and very pretty. It came very quickly, was packaged nicely. My granddaughter loves “my little pony” so I got this for her birthday.